According to our calendar, March 24-30 is Cleaning Week! Didn’t know that was a thing? That’s okay, we didn’t either. But let’s be honest, who couldn’t use a few tips to keep your home green and clean? I know that I, personally, tend to run out of cleaning supplies and find myself walking the aisles of a local store for a green-ish cleaning option that probably isn’t as “clean” as I want it to be. I decided that March is the perfect month to make an effort to green my clean and restock my sink with better options than I currently have. In addition, with all the greenwashing that happens, it’s hard to know if some cleaners live up to their claims. If you don’t have tons of time to read labels (because life gets busy quickly), one way to do a quick under the sink revamp is to trust the folks at Switch 2 Pure. This store is dedicated to providing customers with a carefully curated collection of products, and they have a great Nurture Your Nest kit that contains a variety of green products to keep your home happy and your family healthy. If a kit isn’t your thing, then let’s get into what Janis keeps at her house! 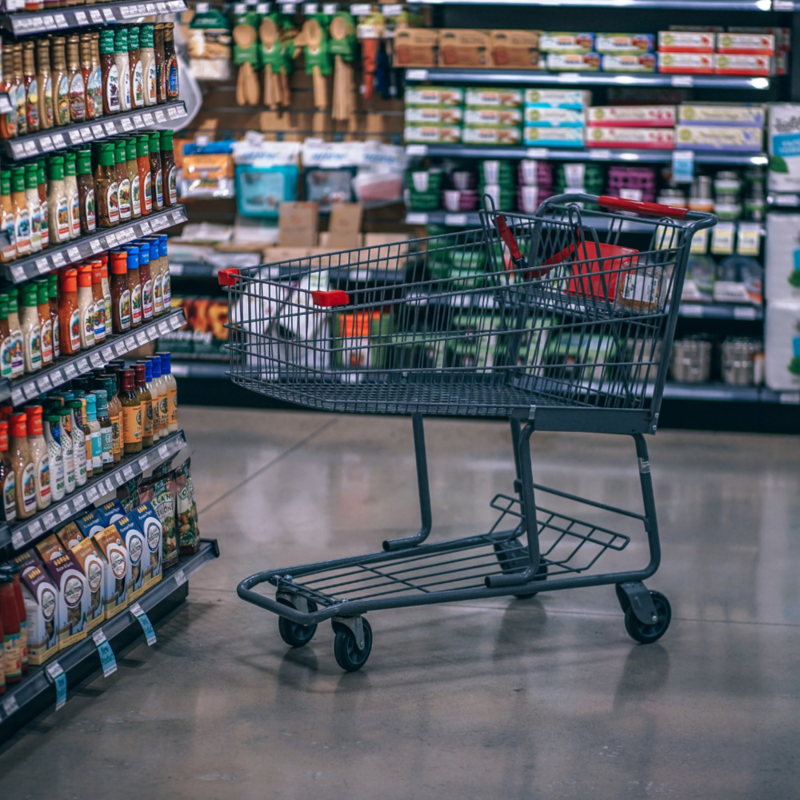 I’m sure you won’t be surprised to know that Janis is a bit of a green guru amongst her friends, and it isn’t uncommon for someone to send her a text asking what they should buy when they are looking for a good green swap for a household product. Home cleaning: We all know that we don’t actually need a different cleaner for every surface in the house, right? And that most cleaners are very similar formulas in different concentrations? 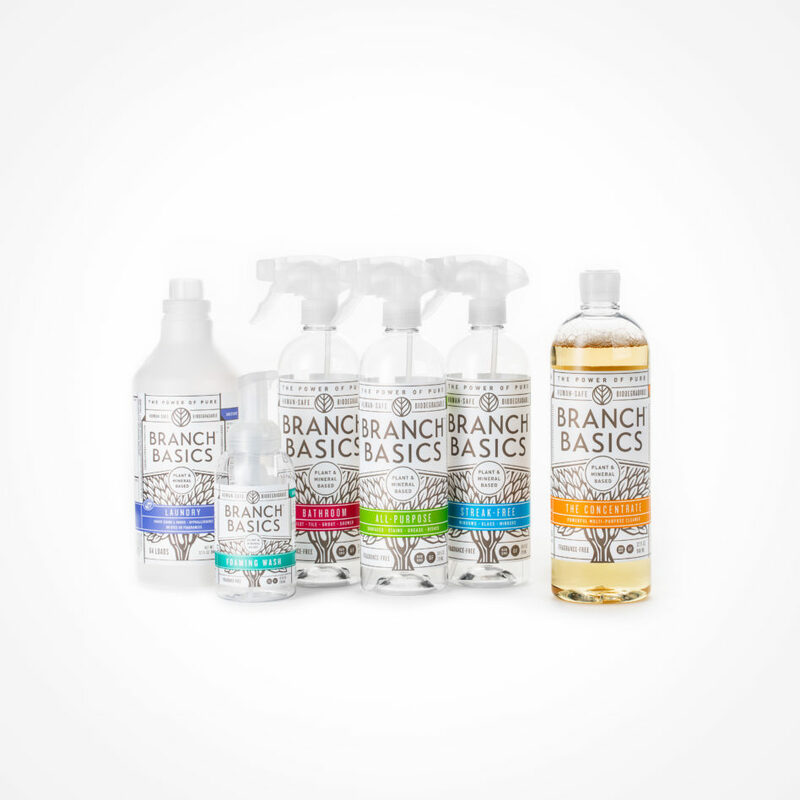 Enter Branch Basics, a company with a very cool idea – one universal cleaning product used in different concentrations for different purposes. So, while you will still have separate bottles for specific needs, they can all be refilled with the same concentrate in varying amounts. One refill bottle for all my cleaning needs? SOLD! Plus you can re-order just one concentrate and keep using the same product bottles, perfect if you want to cut down on your plastic and packaging waste. Branch Basics was awesome and provided a coupon code for all our readers! Use code healthyhome15 for 15% off starter kits here. 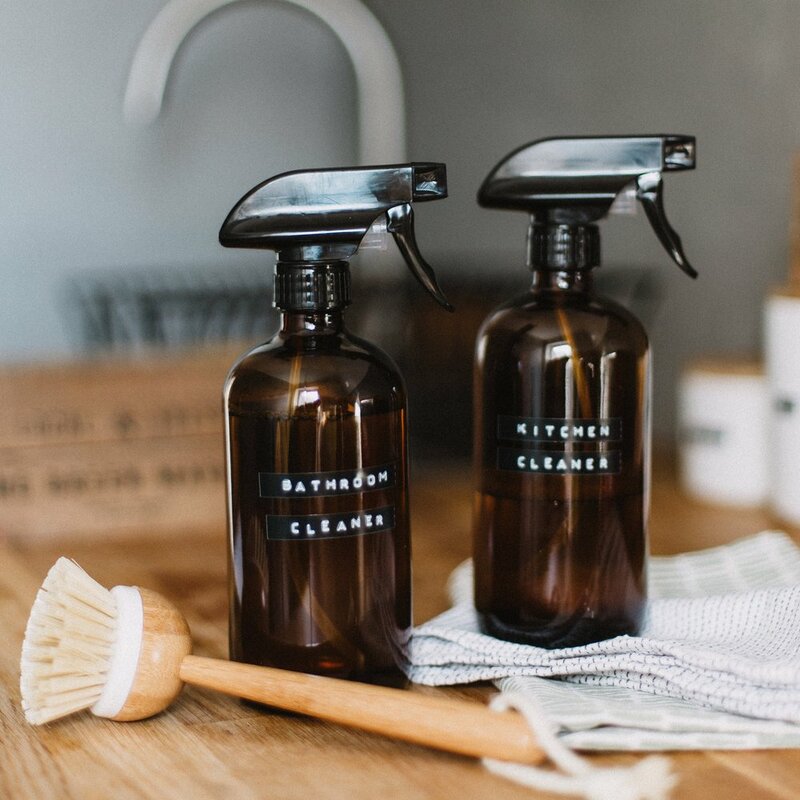 If buying cleaners isn’t your thing and you want to DIY, Janis gave me her favorite option, included below. The bonus here is that you can repurpose any bottle you happen to have. Laundry: If you don’t have a never ending pile of laundry in your house, please tell me all your secrets to life! There are 5 people in my house, including a teenager, and the laundry never seems to go away! With so many products claiming to be free and clear, it can be hard to find a good detergent that is actually environmentally friendly. Buckaroo Organics makes a powdered detergent that is good for cloth diapering and doesn’t contain ingredients that will pollute water (important if you have a septic system that drains your wastewater back into the ground). If you prefer more options than classic powder, Molly’s Suds is also environmentally friendly and comes in a variety of formulas, including one that is great for swimsuits! We reached out to Molly’s Suds and they gave us a coupon code for our readers, use code Kosmatology until 5/1/2019 for 20% off any order on their site. Both companies sell wool dryer balls, and if you haven’t ditched the dryer sheets yet, now is the time! Apply a drop or two of essential oil to a dryer ball if you love having you laundry scented. Can’t give up the fabric softener? No worries, just add a cup of baking soda to your wash. The baking soda will soften your clothes without the nasty chemicals. If you just spent the time cleaning up UNDER your sink, you may as well take a minute to clean up what you keep next to the faucet. You probably use hand soap more than any of the cleaning products listed above, and this is the one that you purposely apply to your skin. And yes, you do rinse soap off, but you want to be sure you aren’t left with a layer of fragrance or chemicals on your skin. Kosmatology’s Foaming Hand Soap is a great way to keep hands clean, and won’t leave anything behind that shouldn’t be there. In addition, because our hand wash doesn’t contain any chemical anti-bacterials, you aren’t adding those byproducts to wastewater and the surrounding ecosystem. If you have a DYI cleaner you love, please comment below and let us know, we always love to hear from you and we love to learn new things! Until next time, happy cleaning from the Kosmatology crew! 2. Shake to mix them together. 3. Add the essential oils directly to your spray bottle and shake to incorporate. To use, spray any areas that need to be cleaned, rinse well, and wipe dry. For tougher cleaning jobs, such as grout spray and scrub with a brush.